Wanna sound like Little Walter, Big Walter and all the key amplified harmonica players? Are you thinking about taking your harmonica playing to the next level or have a friend who would love to get amplified this Christmas but don't know what you need to get set up? You've found it here, a complete blues harmonica starter pack including everything you need, mini-amplifier, matching impedance microphone and FREE blues harmonica to get things cookin'. The blues harp is in 'C', the best key for harmonica if you are a beginner out or getting going. A great 'all-in' deal as a gift or for yourself. At this price you can't afford not to to go electric. 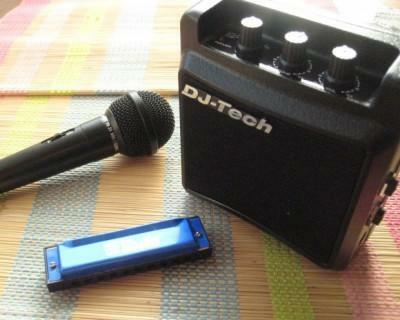 Nothing else required, plug in and go if it is for a beginner harmonica player or not! FREE HARMONICA-SAVING OF £4.99 Only Red available.